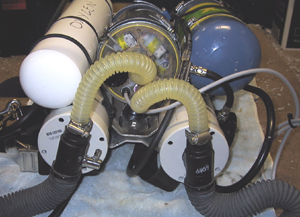 Dr. Richard Harris is an anesthetist who build his own Closed circuit Rebreather. His homepage gives you all the details but I thought it would be nice to add this design to the homebuilders section. 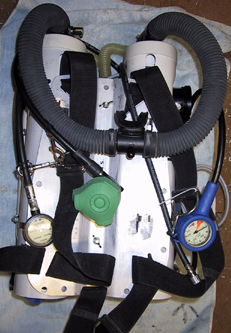 I am very happy Richard allowed me to use his pictures, and I am sure this rebreather will give many people a good help in designing there own! 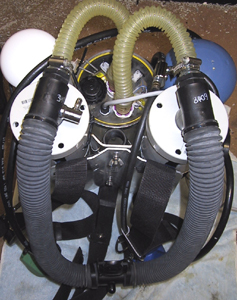 This is a manually controlled "KISS Style" closed circuit rebreather. 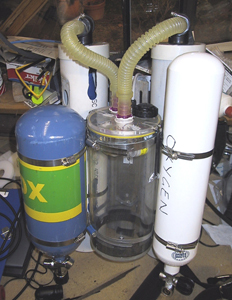 It consists of a back mounted coaxial CO2 scrubber, split back mounted counter lungs of approximately 3.5 liters each, one cylinder each of oxygen (3l) and Diluent (4l) all mounted on an aluminium back plate and harness. Diluent (air at this stage) is added automatically into the inhale C/L via a modified Dräger Ray dosing head which acts like any 2nd stage demand valve when the C/L develops a negative pressure (i.e. is empty). Hence air will be added during the first few breaths on the CCR and during descent. 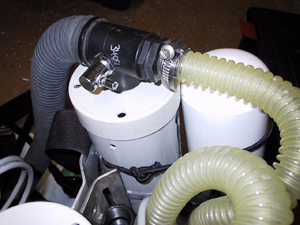 Oxygen is added into the exhale C/L by the modified KISS valve which operates via an adjustable needle valve. This is set at just under one's metabolic requirement for O2 so that the O2 levels in the loop are in a constant state of decay. This means that O2 is added infrequently via a manual over-ride. 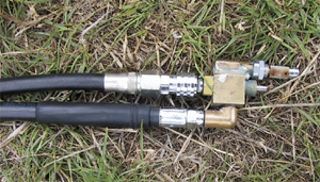 Correct adjustment of the needle valve will mean very infrequent O2 addition will occur. 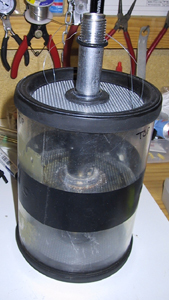 The scrubber is based on a canister that I got off an old anesthetic machine. This saved me having to make the hardest part which is the container for the soda lime. It is a coaxial design but otherwise is based on the one on Mark Munro's website. I am particularly pleased with the lid which my mate Phil Booth turned and milled from 20mm acrylic. The cylinder itself is cast acrylic (not as thick as I would have liked due to the cost). I like to be able to look into the scrubber and see obvious problems happening with the sensors or soda lime. It should have better thermal insulation than a metal scrubber also. 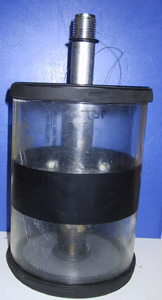 The scrubber lid contains an overpressure valve from a BCD, 3 R22D O2 sensors and the inflow and outflow tubes. The central white 30mm PVC tube on the underside snugs down over an O ring on the soda lime canister. The cable contains the wires from the sensors to the Mark Munro panel shown below. I have joined all the earth contacts to a common earth so only 4 wires leave the scrubber lid. On the left is the canister unit which slides down inside the acrylic tube. These are made from the PVC backed nylon I mentioned. Easy to glue and sew, I will see how long they last! The lungs sit inside 4" PVC tube which is open to the water. The tubes afford the lungs some protection and are also used to mount the tanks. The C/Ls are kept as close to my body as possible. 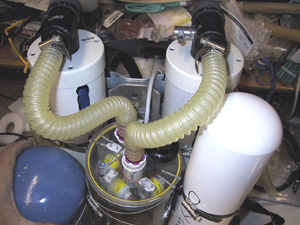 The right photo shows the Dräger dosing head off a RAY which pierces the PVC and enters the (inhale) C/L via a P connector, so it can easily be detached. 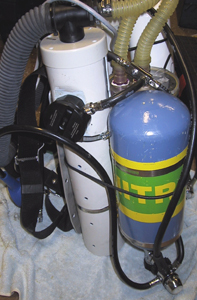 Gas is supplied from the Diluent bottle which also feed a bailout 2nd stage and gas for the wing and dry suit. The Dräger manifold distributes this nicely, although I've still got a way to go with hose routing. 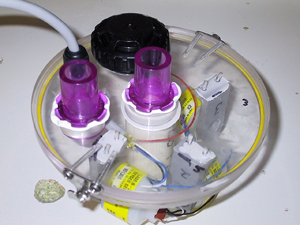 The dosing head has been modified by changing the sealing tube to one off a Dolphin. This gets rid of the constant dosing feature and makes it a demand only valve, i.e. an ADV. Mark Munro supplies these kits in a variety of forms. The alternative is the Dräger Oxygauge which gives you one sensor but at a price. This is a picture of the panel before being housed in the 32mm ID polycarbonate (Lexan) tube I purchased from McMaster-Carr (http://www.mcmaster.com/) who can supply all sorts of good stuff. They are super quick and reliable posting to Australia. The next step will be to mount another sensor in a T-piece, placed in the inhale arm of the breathing loop and connect this to my VR3 to maximize decompression efficiency. Kindly assembled for me by Chris Law, this valve I believe was originally designed by "Tubby" in Qld. 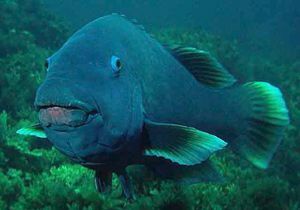 It is developing a strong following and has now successfully dived to over 80m on the Bayonet wreck off Bass Strait with the mod Dolphin mixed gas CCR. It has all the lovely simplicity of Gordon Smith's KISS valve with the additional feature of on the fly adjustment. When used in conjunction with an ambient compensated 1st stage (as opposed to the KISS), it should not have any practical depth limit. 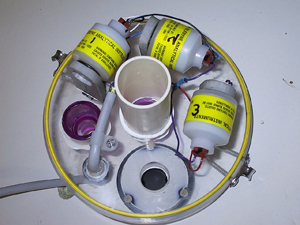 The valve is connected into the exhale T piece via a LP snap fitting from a BCD inflator assembly. This shows the adjustable needle valve and the manual over ride button. Richard, thanks for your contribution!